I’m fortunate to live just a little over a mile from where I work and one way I like to spend my lunch hours when I’m not runching is seeing what I can whip up in 10-15 mins with what I have around my kitchen. It’s like a creative brainstorming exercise away from my computer that helps me reset and be more productive the rest of the day. This recipe came about in one such session and has become one of my favorites. I make homemade hummus as an easy protein rich dip for my veggies but was out of garbanzo beans on one occasion. Fortunately there was can of cannellini beans lurking in the back of my pantry. If you’ve ever worked with cannellini beans you know they’re exceptionally buttery and smooth making them an excellent pallet for all types of yummy flavors. I decided to swap them in for the garbanzos and play off a classic, green goddess dressing. Also called white pinto beans, cannellinis are a staple in central and southern Italian fare prepared with tomato based sauces, olives and, other savory veggies. Like most beans they offer an impressive nutrient profile packed with iron, magnesium, folate, and a hefty dose of fiber. So I found my cannellinis and since it was the day before when I go grocery shopping I really only had a few other staples to work with – lemon, olive oil, nutritional yeast, garlic, tahini sauce. That’s the beauty of having staples always stocked. The key flavoring ingredient in this recipe is the tahini sauce from Trader Joe’s which I recommend vegans and meat eaters alike always keep on hand. It’s pretty much hummus without the garbanzo beans (sesame butter, lemon, olive oil, garlic) and adds a nice nutty depth and tang to the dip. 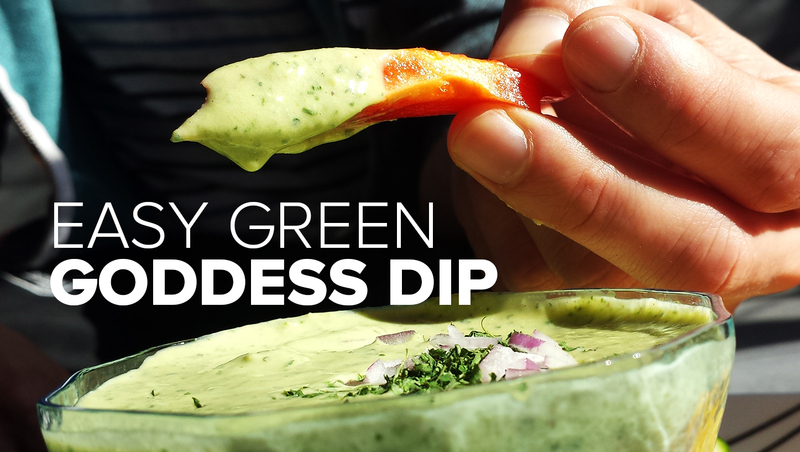 I call it a dip but this recipe is just runny enough that it can double as a rich creamy salad dressing. By adding a little more olive oil, water or lemon juice you can get it to you desired thickness and use it on all sorts of dishes.